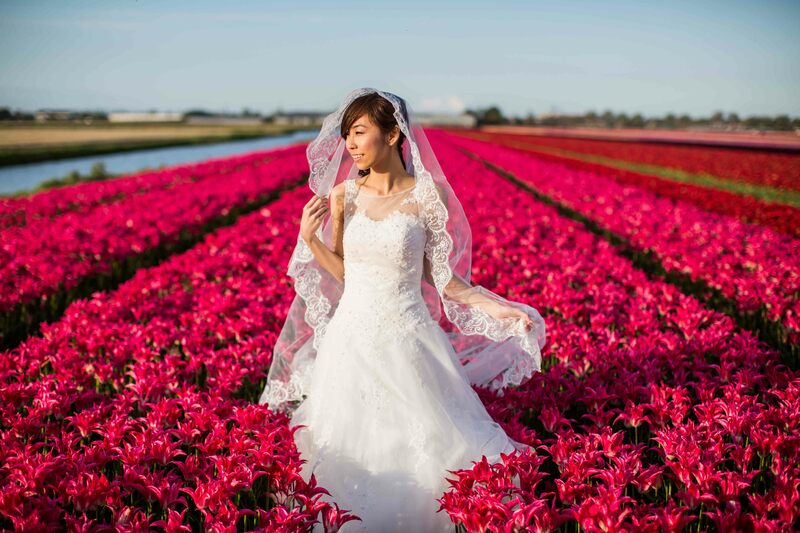 This page is dedicated to pre wedding photography in Amsterdam, the capital city of the Netherlands / Holland. The old city of Amsterdam is often overlooked when couples are searching for their destination pre wedding photoshoot in Europe. 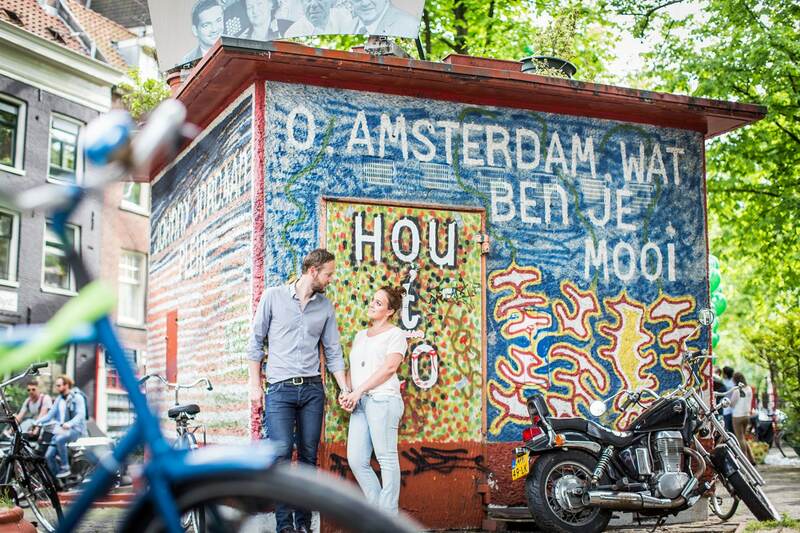 Cities like London, Rome, Venice, Santorini, Prague and Barcelona are very popular and rightly so, but Amsterdam should not be underestimated if you are searching for a location for your engagement photoshoot. Amsterdam has it all, from old buidings all over the city, canals, bridges and stately palaces. 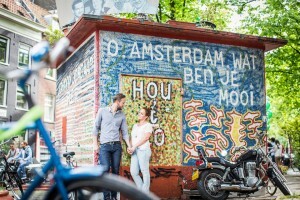 On this page I will show you the diversity of Amsterdam to show you that this city makes for a perfect backdrop for your pre-wedding photoshoot. Set in the middle of Amsterdam, the Dam square is a very big square adjacent to the classical Royal Palace, Paleis op de Dam. It’s a busy, bustling square with magicians, mime-artists and more. It also is the place where quite some big streets come together, making it a hub for trams, bicycles, cars and pedestrians. The square is only a 5 minute walk from Amsterdam’s central station and usually the starting or ending point for couples that have booked me for their prewedding photoshoot. What’s more iconic in Amsterdam than the canals? Used back in the days as the public sewer system, the canals in Amsterdam are now a place for people to ride their boats or to ice skate in the winter. There are many canals to chose from and we will walk around the city to capture you along the most beautiful canals for your photoshoot. In springtime, when all the trees are starting to blossom, the canals are coming back to life after the winter. In summer, all trees are in full bloom and the entire city is filled with green. During the fall, the leaves are starting to change color, giving the city a yellow and orange hue. Set on the Museum square right in front of the iconic Rijksmuseum building is the world famous I-AMSTERDAM sign. 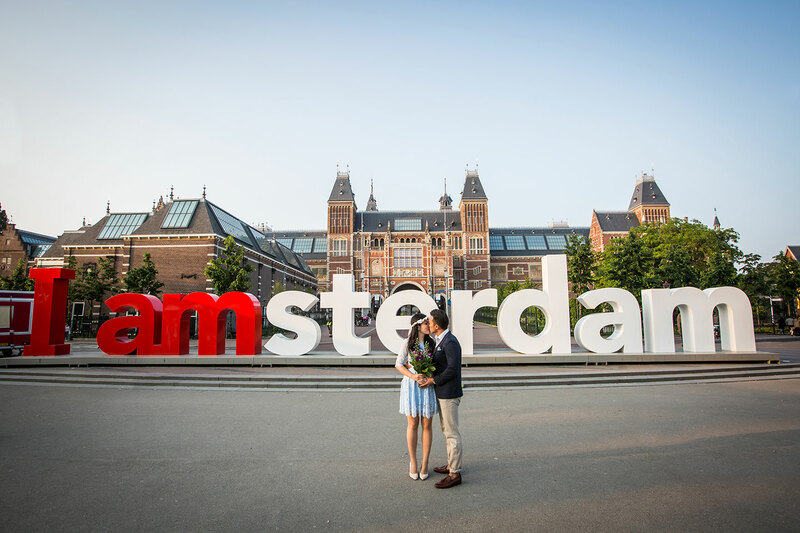 These bright red and white letters have become a sensation on Instagram and are great to include in a pre wedding photoshoot when in Amsterdam. The entire inner city of Amsterdam actually feels like one big open air museum. The houses along the canals are extremely well preserved and many buildings have a slightly different architecture and color, making it an interesting background for your photoshoot. Interested in pre wedding photography in Amsterdam with me? Send me an email via my contact form and I will be in touch with you shortly! Looking forward hearing from you!